By Murat Mirata, based on the original research conducted by Albin Klang, Fanny Törngren, and Lena Ländin. The industrial symbiosis network in Avesta revolvles primarily around heating energy integration among regional actors and clearly demonstrates the environmental and business benefits of symbiotic relations, as well as their contribution to innovation. The Avesta region is close to valuable natural resources as the Dalälv River and various mines and relatedly has a long history of being a mill town. Steel manufacturing began in the early 14th century in the region but in the 17th century it changed to copper. The local mint was for nearly 200 years the major manufacturer of coins in Sweden. Coin production era ended in the 19th century and a few decades later steel production came back to the region along with other industries including a sawmill and a paper mill. Today an industrial symbiosis network is operational in Avesta, where Värmevärden AB, Outokumpu AB and Karl Hedin AB, Avesta municipality, Harsco and AGA Gas AB are a part. The key actors or the network and their relationships are graphically depicted in figure below. Information about the main members of the symbiotic network is given below. The Avesta municipality and region has around 22 300 inhabitants. The household waste generated in the region is collected and supplied to Källhagsverket power plant as fuel. Värmevärden AB is an energy company that delivers district heating to residences and industries. The company operates in ten municipalities in mid-Sweden. The company often actively works with synergistically integrating their district heating business with local industries. For example, they investigate the excess heat availability from the industries and then approach them with ideas for synergies, which have the potential of being profitable for both actors. Värmevärden AB currently owns the district heating network and Källhagsverket plant in Avesta, which only produces heating energy. 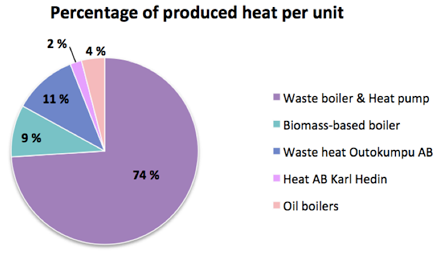 In 2014, 235 GWh of heat were delivered to the district heating network, whereof 200 GWh were produced in Källhagsverket. The proportion of heat sources is shown Figure 1. Värmevärden AB have chosen to focus on district heating as well as investigate and implement synergies in excess heating, as the upgrades required for electricity production are extensive and costly.The company sees itself as a system coordinator and initiator as well as an anchor. Not only in Avesta, but also in other regions the company approaches industries with synergistic proposals that are profitable for each actor. Värmevärden has developed unique organisational capabilities that allow them to effectively identify, develop and maintain synergies. AB Karl Hedin is one of Sweden's largest privately owned sawmill and trading group with operations in mid-Sweden and the Baltic countries. Their business model is to deliver high-quality wood mainly for construction and packaging. In Krylbo outside Avesta, AB Karl Hedin owns the sawmill producing sawn and planed wood products. Today AB Karl Hedin sell their wood residues to the company Agroenergi Neova Pellet in Norberg for pellet production. Outokumpu AB is a global leader in stainless steel with a cold-rolling capacity of 2.6 million tons. Outokumpu AB’s largest production facility in Sweden is located in Avesta and it is the only stainless steel foundry in Sweden. The material inputs to Outokumpu AB are mainly recycled steel, which is 100% recyclable. Outokumpu AB’s main residues consist of hydroxide sludge, flue dust and iron sludge. The residues are mainly being recycled back into the process, dumped at landfills or transported to companies that buys residues and then sells them as resources to other companies. Outokumpu AB also has a synergy with AGA Gas AB, which is specialised in the production of industrial gases and today owns and operates an air-gas factory at Outokumpu AB’s production site. This plant produces, stores and distributes oxygen, nitrogen and argon to Outokumpu AB. Continual production of these gases are critical for uninterrupted production of steel products. The heat for the production of the gas is sourced from district heating. Stora Enso Fors AB is one of the world’s largest and most modern producers of paperboard for consumer packaging and printed matter.Their main inputs are biomass, chemical pulp and chemicals. Their main waste outputs are bark, sludge and ash. The pellets from Neova are used by Stora Enso Fors AB in their pellet boiler. Stora Enso Fors AB has never been included in the heating synergies in the Avesta region, despite the fact that they use heat energy and produce excess heat that is unused. This is motivated by technical and economic reasons. More specifically, the district heating temperature is lower than what is required by their processes. Moreover, district heating demand in Avesta is considered saturated and delivery of excess heat will require a new 10 km long pipeline, which would entail major investments. The foundation of today’s main synergy network consists of the stainless steel manufacturer Outokumpu AB, the sawmill AB Karl Hedin and the energy company Värmevärden AB delivering district heating. The first synergy began in 1996 between Avesta Sheffield AB (today Outokumpu AB) and Avesta Energi AB (today Värmevärden AB) who then owned the district heating network in the Avesta region, including the Källhagsverket plant. The synergy consisted of transferring heat between each other. Avesta Sheffield AB would sell excess heat to the district heating network at certain times and buy district heating from Avesta Energi AB during certain times. 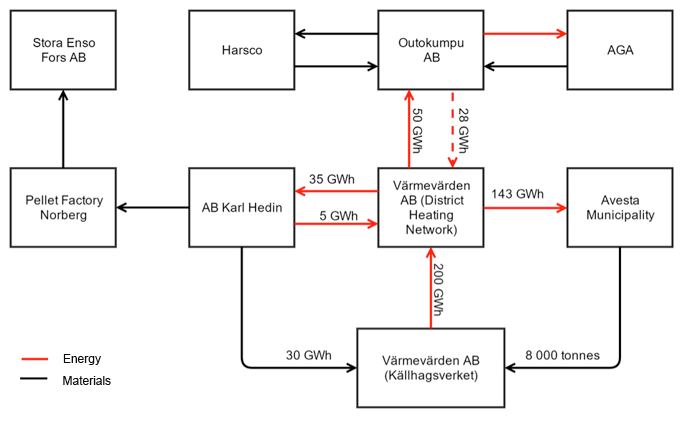 A few years later the district heating network and lKällhagsverket was acquired by Fortum AB but the synergies were maintained. In 2008 Fortum AB approached the sawmill AB Karl Hedin located in Krylbo, a few kilometers outside Avesta, with an idea to to replace some of the sawmills heating need for wood drying with district heating. Mill's heating needs would be met fully by district heating in summer months, and in winter months the district heating would be combined with the heat produced by the mill's own biomass boiler. 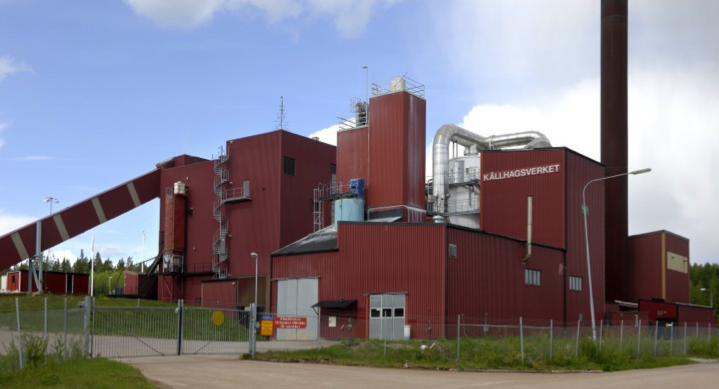 They would also deliver heat from their biomass boiler to district heating network during certain times in the winter and a few weeks in the summer when Källhagsverket would be stopped for maintenance. As a part of the cooperation, Karl Hedin would also sell sawdust to Fortum to be combusted in Källhagsverket. One year later, in 2009, these ideas were realized and the synergyies that are stil operational today were initiated. Karl Hedin became the first actor in Sweden drying their wood with district heating. In 2011, the business interests of Fortum AB changed and the district heating plant and network in Avesta was acquired by the newly formed Värmevärden AB, jointly owned by an Australian venture capitalist and a Canadian pension fund. Both the workforce of the company and their synergistic relations remained intact following this ownership change. The benefits gained with a concept such as industrial symbiosis vary and depend on various factors. In Avesata, different actors perceive different benefits linked to their synergistic relationships, which include reduced costs, improved environmental performance in the region, improved efficiency performance, innovations and knowledge upgrade. All of these are recognised to contribute to business competitiveness. One of the actors gives a more direct answer in the benefits being founded on economics only. Another actor also identifies the reduction of costs as the most important benefit and connects the savings to reduced fuel-use as well as to the avoidance of costs associated with maintenance, control and inspections of boilers for example. They underline that economy and environment does, and needs to, go hand in hand. The third actor mediates a wider reflection over the drivers and benefits associated with the work. They express a wider range of comprehension and appreciation of the drivers’ significance, possibly liked to their connection to the company’s core business and quite unique business model. For all the actors, awareness of the link between energy use and operational costs, and clear returns on investments served as important drivers. More efficient use of capital is an important driver with the motivation that micro management would be more costly than macro management. Improved environmental and economic performance offered by collective energy solutions, as opposed to each private or industrial actor meeting their needs individually, is certainly a strong driver. Värmevärden AB regards the improved environmental performance as a distinguished benefit, as centralised energy production allows for more advanced control and gas treatment. Furthermore, use of excess heat reduces primary energy need and improves resource management. Lower system costs are an easy-to-measure benefit making it a preferable driver. Last, existing synergies allow the actors to meet potential future regulatory demands, such as improved energy use. Last, but not least, it is believed that the synergies were instrumental in developing a mindset that supports energy conservation. For the initiation of the heat synergy between Avesta Energi AB and Outokumpu AB, the former being in need of extra capacity was a key driver. Also, public ownership of the energy company was seen as a factor that reduced the risk perception of Outokumpu AB. Having the synergistic relations governed by mutually satisfactory and flexible agreements is considered to play a key role for the development and maintenance of synergies as well. This way, involved actors feel that collectively generated value is fairly shared. They also maintain satisfactory flexibility to implement technical or operational changes, without excessive dependence to others. Another important driver was strong technical skills of specialised actors. The roles of particular actors in an industrial symbiosis network is an interesting topic for analyses. This study has also explored how the actors consider both their own and others' role in the synergistic network. In Avesta, Värmevärden is considered to be a key actor fulfilling multiple important roles. The company is an important physical anchor utilising and providing large volumes of resources. It also acts as a system operator and a hub enabling connections among different regional actors. Värmevärden is also recognised to serve as an institutional anchor, as the company provides awareness, knowledge and technical skills to the others. It even serves as a coordinator by identifying and developing new synergies. The company is also seen to put more effort into maintaining synergies, and in some cases hold more power over their operation. Other actors in the network are more like physical anchor roles due to their fairly stable resource needs and supplies. These actors acknowledge the significant role of Värmevärden in initiating new synergies and providing technical and operational expertise. In studying the network in Avesta a few potential for future developments. For example, there is still significant amounts of residual heat from Outokumpu AB and Stora Enso on the region, that is today unutilised. As mentioned earlier, distances among actors and a saturated heat market hinder increased utilisation of excess heat. However, it would be meaningful to explore alternatives for increased utilisation of such resources. Reducing waste incineration for heat production, and drying the sawdust generated by Karl Hedin which can then be used as fuel in Stora Enso are among the options that could be further investigated. Another potential is linked to the digestion of organic sludge produced at Stora Enso Fors AB, possibly together with the organic waste sorted by the Avesta municipality in a digestion facility built in proximity to the region. Stora Enso Fors AB has explored the possibility of building a digestion facility on site but not found the economic driver making such a project feasible.